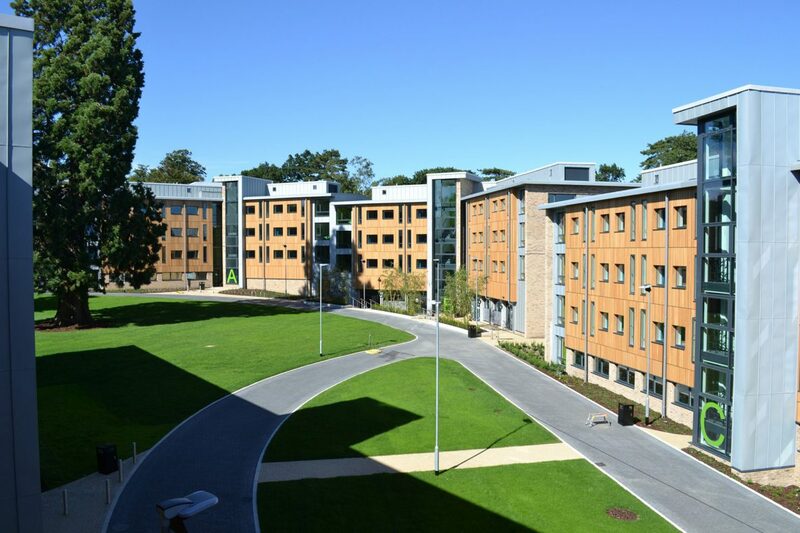 Located in Bassett, a leafy suburb of Southampton, Chamberlain Hall sets a benchmark for contextually sensitive student living design. 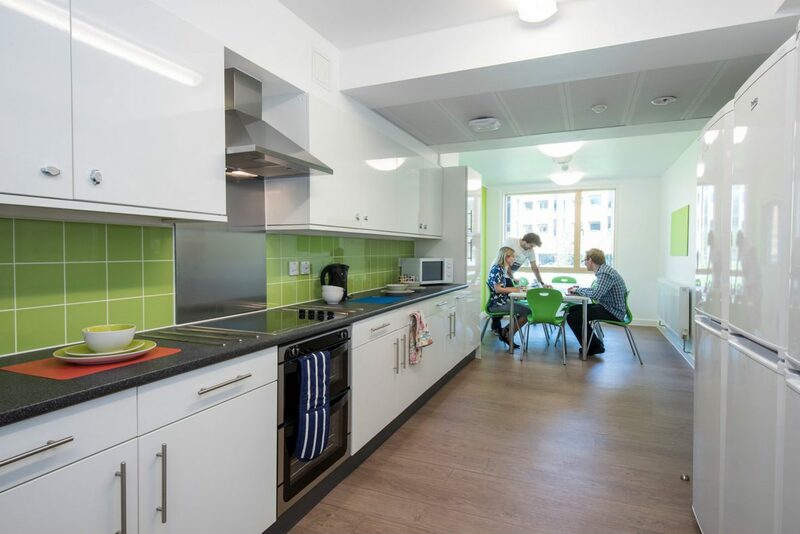 The three and four storey development comprises 356 student bedrooms in 41 cluster flats and a student hub. 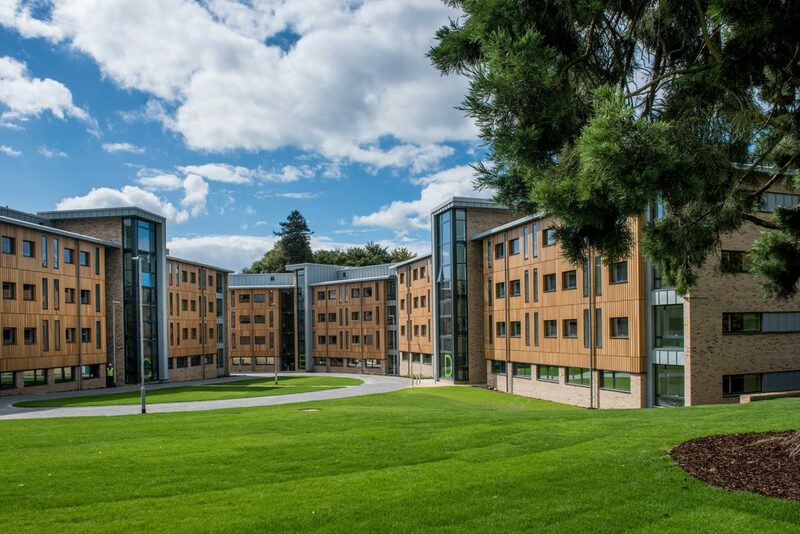 The architecturally distinctive, but visually restrained buildings create a strong sense of place, responding harmoniously to the site’s varied topography and spectacular mature trees. Planning was received for an additional 64 townhouses that could come forward as a second phase. The layout generates a series of pleasant informal recreation spaces, screened from immediate neighbours, with safe and legible routes through the site forming well-defined connections to neighbouring University accommodation. 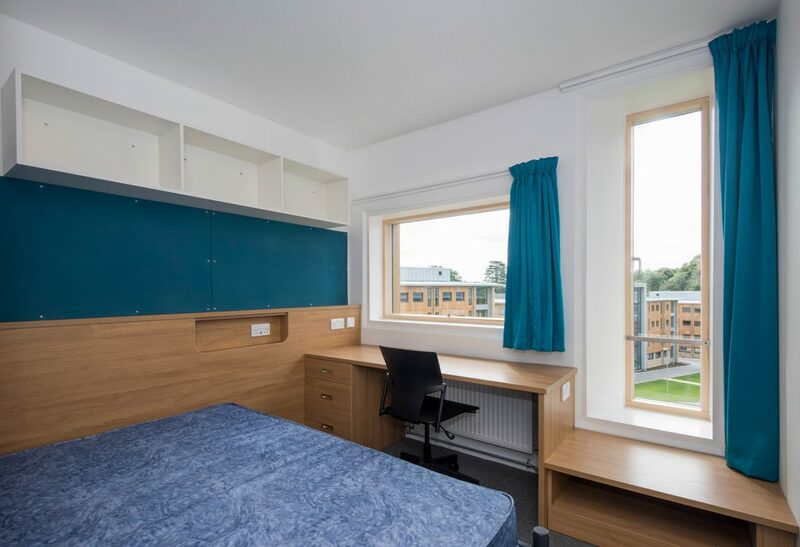 Flats are arranged in clusters of 8 and 10 study bedrooms arranged along a central corridor, with communal kitchen/dining spaces at the end. These generously daylit social spaces overlook the courtyards, increasing visual connections between blocks and enhancing security. 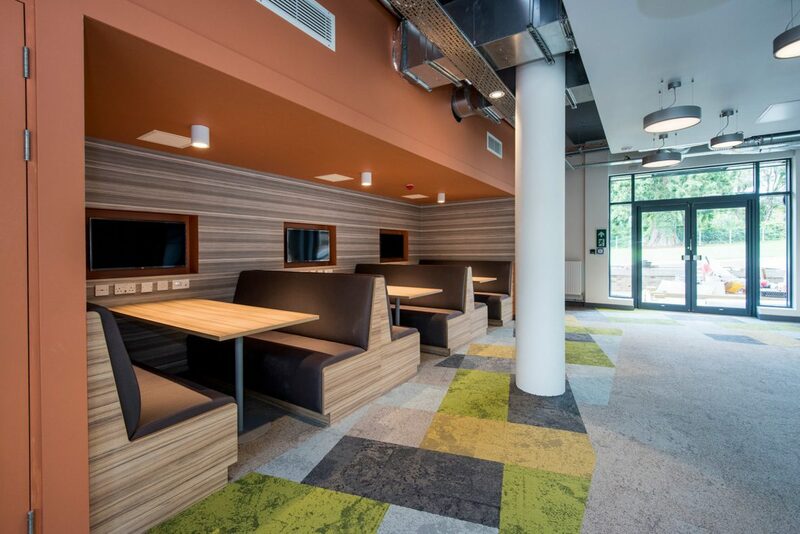 The social hub, located close to the new bus and Uni Link facility, includes a welcoming ‘arrival zone’, with a mixture of informal study and social spaces. 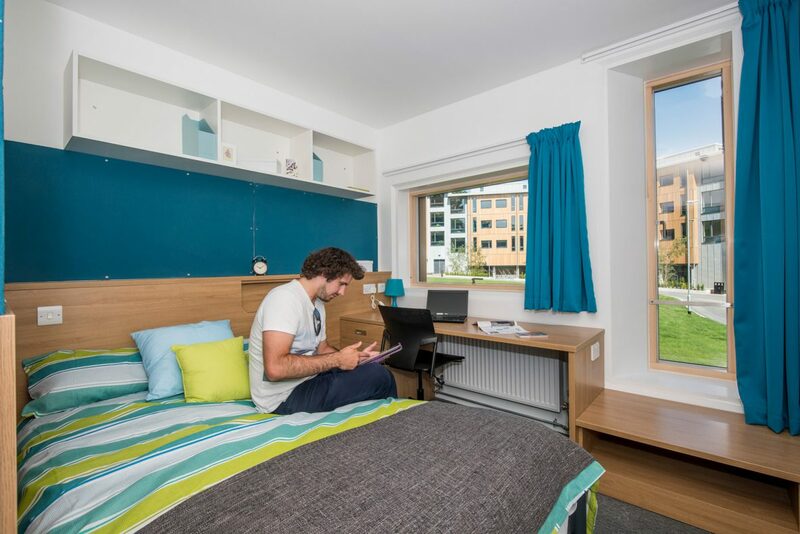 Additional study rooms are distributed across the accommodation blocks, offering convenient individual and collaborative study facilities. 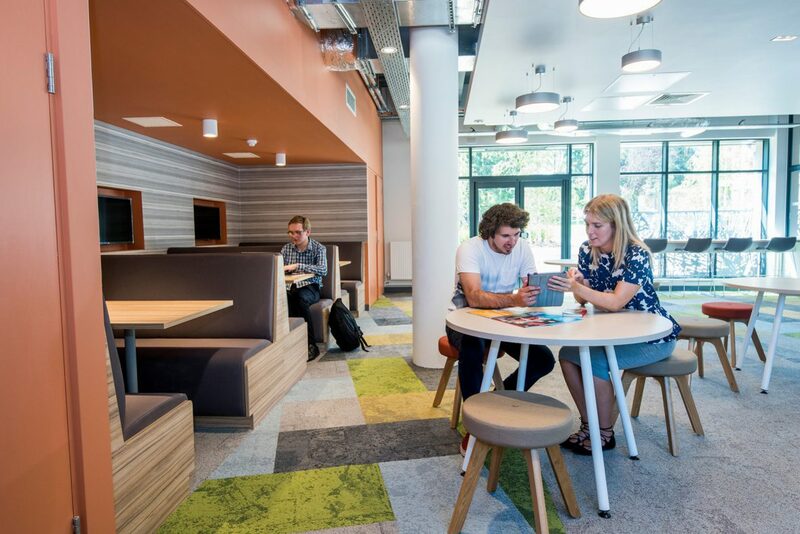 The interior design concept takes the theme of nature and outdoor space – bespoke timber seating and natural textures – which the University promotes as a major asset to the quality of campus life. Pebble and grass look carpet is laid in a geometric design that orientates towards the external views. Lounge furniture is specified for inside and outside use, so landscaped spaces can act as an extension to the hub. Lounges are equipped with audio visual technology: two 70 inch LCD screens, gaming console, headphone bars and study booths with wireless monitors. 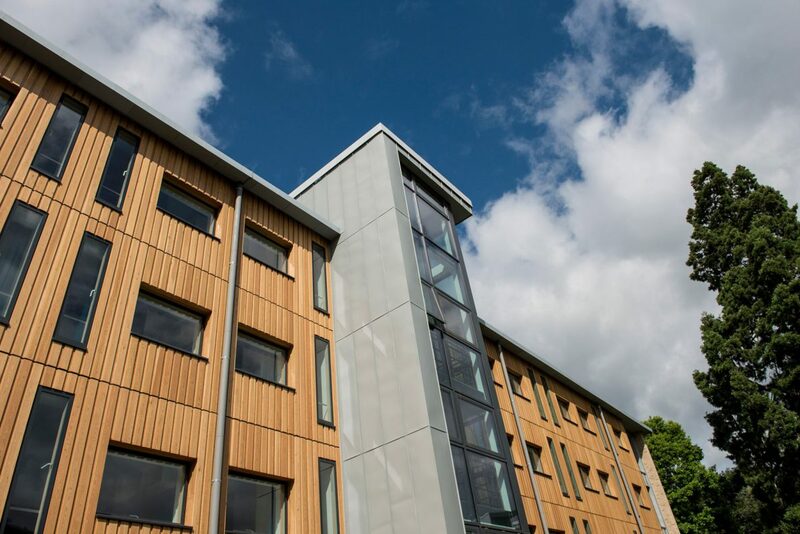 The University’s sustainability requirements are realised with a BREEAM ‘Excellent’ rating and Eco Campus status. 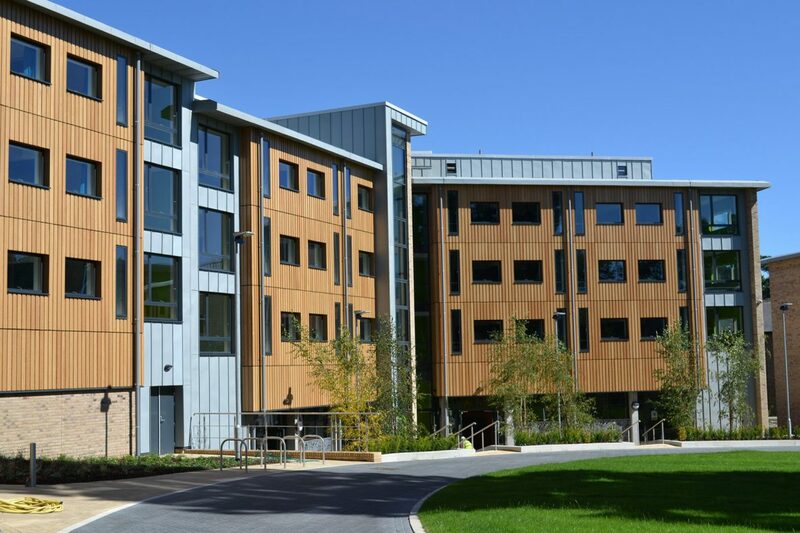 The newly completed Chamberlain Hall offers many examples of excellent design features. The design team paid particular attention to the use of natural light to keep the bedrooms and kitchens bright and inviting. 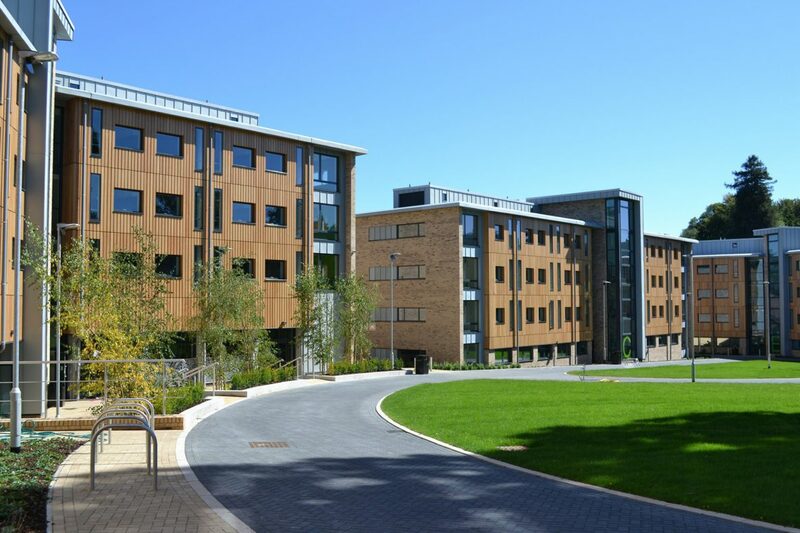 The common rooms are light and airy spaces full of contemporary furniture, while the green courtyard, enclosed by the buildings and trees, provides a quiet and private area for relaxation. Stride Treglown was the original design consultant and was retained as client advisor, as well as the interior designers, with delivery carried out by Architecture PLB.